Prince Harry and Meghan Markle have received many beautiful gifts from the Australian public during the first four days of their royal tour. And they will probably get much more when traveling to New Zealand, Fiji and Tonga. 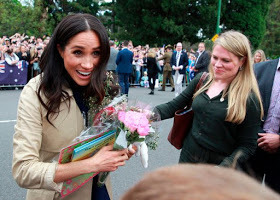 On Friday in Sydney Meghan looked shocked when she was handed a bunch of carrots before he said excitedly to Harry, "We have vegetables!" The carrots were later depicted on the ground with other gifts to the Duke and Duchess. But what exactly happens next? Are you allowed to keep the gifts and do you use them? Although every gift giver would like to think that Harry and Meghan will treasure their presence forever, they can not possibly use them all. Each gift given to Harry and Meghan at public appearances is considered an "official gift." Every single present given to a Royal during an official engagement is recorded on a form. 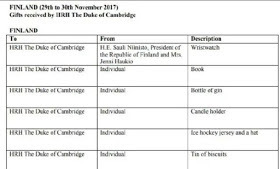 According to the royal family website, these gifts do not become the private property of Meghan and Harry - or a member of the royal family that receives them. The duchess's and duchess's gifts fall into the "official" category as they are "given by persons who are not personally acquainted with the member of the royal family during" walks "." 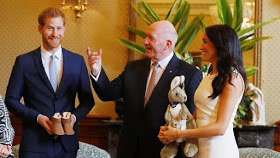 If perishable gifts valued at less than £ 150 - such as the carrots presented to Meghan on Friday in Australia - are not to be personally used by the King (unless Meghan throws them in a stew), then they can be in charities or third parties to avoid wastage. Third parties include Royals personnel, so Meghan could pass these carrots to their royal helpers. Perishable gifts with a value above £ 150 that are not used by the royal recipient, "should go to charity". These saved gifts are reviewed annually by a panel of experts from the Royal Household and the Royal Collection, who consider each gift in terms of its national, historical, aesthetic or financial value. Gifts falling into the first two categories are to be kept for five years. Individuals and organizations who meet the royal family on official commitments are kept from offering extravagant gifts. It is not known what the couple will do with all the teddies and baby gifts given to them. They may choose to keep some of them, but with so many, they will probably choose to give something to a charity so that others can benefit from the generosity of their Australian fans. On the day of the birth of Prince Louis, Kensington Palace issued a statement from Prince William and Kate Middleton to prevent the public from sending gifts to the baby. It read: "The Duke and Duchess of Cambridge are very grateful for the support and goodwill expressed in this happy time. "Their Royal Highnesses, however, do not want to encourage the sending of gifts to them on this occasion, and feel that any generosity of the Spirit felt by individuals should be addressed to those who are in need." They encouraged fans to donate gifts to local children's charities or Evelina London Children's Hospital.